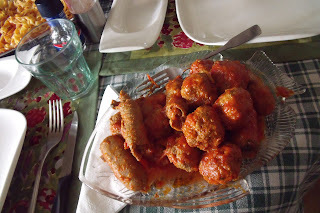 When I was a child, growing up in Missouri, our classic Sunday Dinner (served when we got home from Church at about 1pm) was spaghetti with sauce made with meatballs, sausage and braciole. 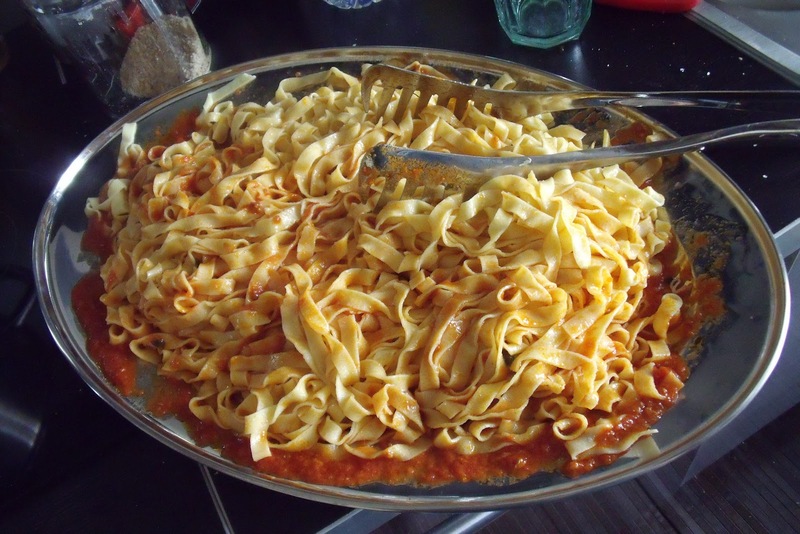 I can vaguely remember my Italian grandmother Paolina making homemade tagliatelle and seeing them hanging on a broomstick supported between two chairs! This meal brings back great memories - just the aroma of the sauce cooking makes me feel at home wherever I am! 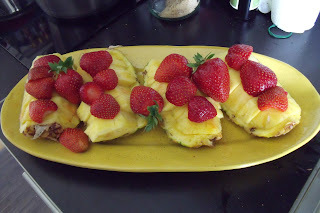 This is my version - I think each of us takes our mother's recipe and we add our own special touches! My mom is a great cook and her good meals are appreciated by all who eat at her table! I learned to cook from her and I appreciate all the things she has taught me - in the kitchen and out of it!! 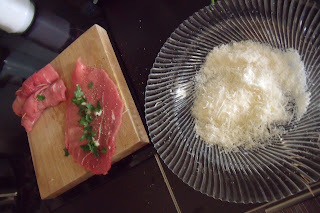 I use slices of young beef, I put some fresh garlic, parsely, grated parmigiano cheese and freshly ground pepper on each slice, then roll it up and secure with a toothpick. Next I make my meatballs. I use lean, good quality ground beef. 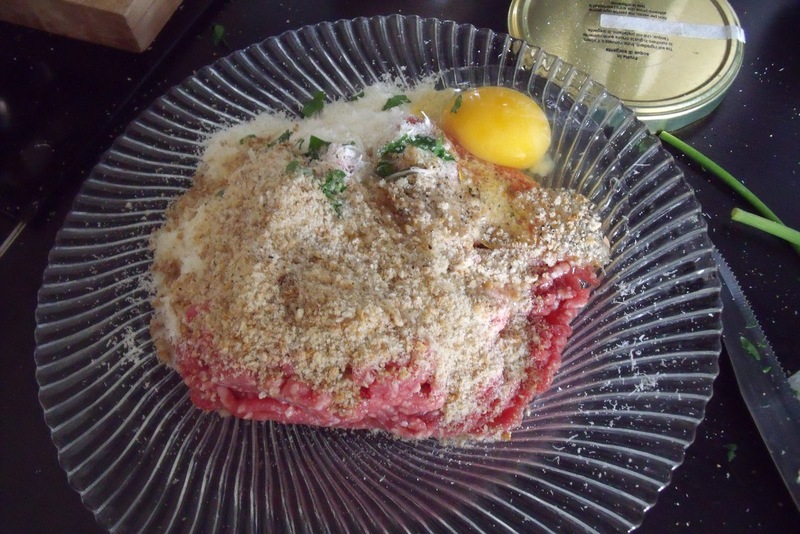 Here I used about 1/2 pound of meat, 1 fressh egg, about a cup of grated cheese (we like our meatballs cheesy!) about 1/2 cup dry breadcrumbs (unseasoned! 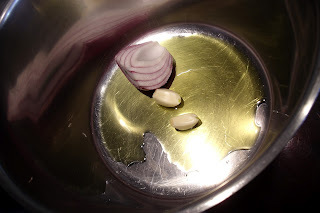 ), fresh chopped parsely, 1 garlic clove finely chopped or pressed through a garlic press, freshly ground pepper. I generally don't put salt, as the cheese is already salty enough! I mix it all together with my hands - fundamental! 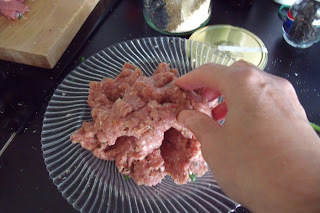 and then make smallish meatballs - about the size of a golf ball. When all the meat is ready, put a couple of tablespoons of extravirgin olive oil in a large saucepan along with a small onion or 1/2 large onion and a couple of cloves of garlic. 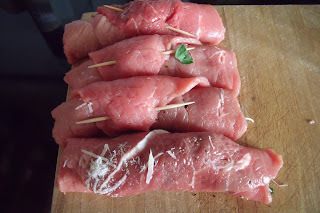 When it starts to sizzle I start adding my meat, keeping the heat at medium to prevent the meat from sticking. 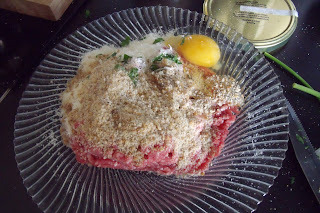 Slowly brown the meat and if you want, add a splash of white or red wine at the end of the browning. 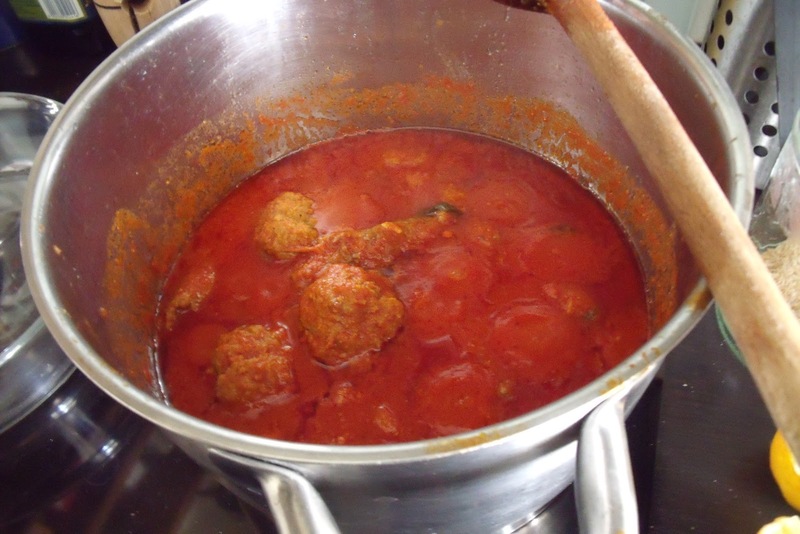 Next blend 1 large can of plum tomatoes - if you can find San Marzano Italian tomatoes, use them! 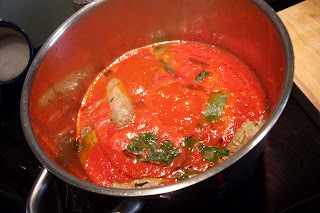 Add the pureed tomatoes to the browned meat along with several leaves of fresh basil. 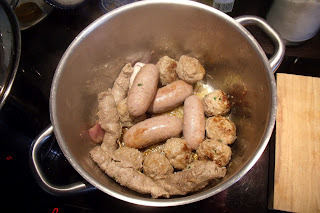 When it comes to a boil, lower the heat to simmer and cover but not tightly. I usually rest a wooden spoon across the top of the pot and rest the lid on it. By the time you are finished making the pasta, the sauce should look about like this. 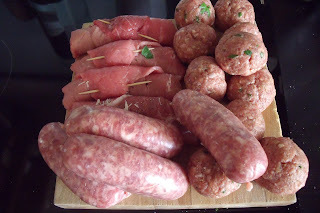 The whole process took me about 2 hours from starting with the raw meat to getting it on the table! Take the meat out of the sauce to serve with the pasta or after the pasta with a tossed saled. 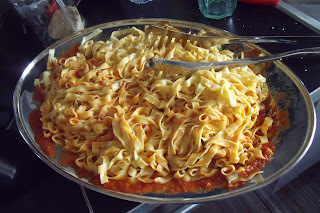 Season the pasta with the sauce and transfer to a large serving tray. Fix a gravy bowl with extra sauce in it for those who like more sauce on their pasta! 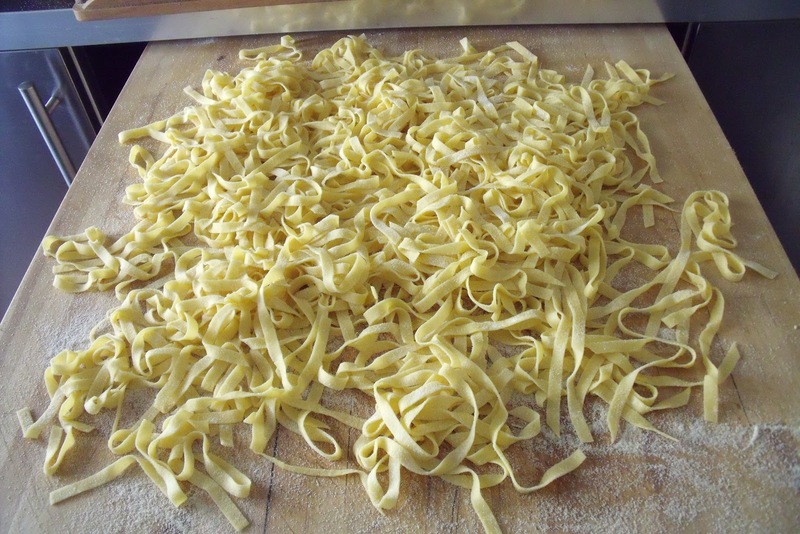 Serve with lots of freshly grated parmigiano cheese and as Julia Child might have said had she spoken Italian instead of French... BUON APPETITO! ps - instead of dessert I served fresh pineapple and strawberries after the meal!